A rhesus macaque monkey rests his chin on a water pipe on Cayo Santiago, known as Monkey Island off the eastern coast of Puerto Rico. 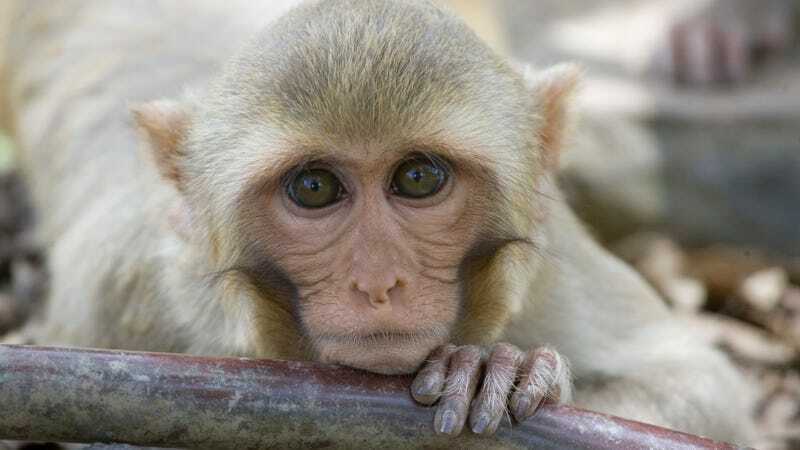 Rhesus macaques are common subjects of primate research. This research grant marks Neuralink’s first successful foray into the arena of animal testing, a necessary but often hidden step in the process of developing brain-computer interfaces. Neuralink previously explored the idea of building a lab in San Francisco that would test on rodents, but ultimately abandoned the project, Gizmodo reported in March. An agreement between Neuralink and the board of regents of the University of California, obtained in response to a public records request, outlines the terms of the deal and the scope of the research to be conducted. Neuralink will pay $796,006 for research conducted at UC Davis’s National Primate Center, one of seven centers nationwide dedicated to the study of health and disease on primates. “Research performed at the Facility and other National Primate Research Centers provides necessary information before proceeding to clinical trials in humans, leading to new drugs, therapies and surgical procedures that benefit human health and quality of life,” the contract states. The Davis research facility, located about 75 miles outside of San Francisco, is home to most of the primate research subjects in the state of California. In 2016, the most recent year for which the Department of Agriculture has released statistics, there were 3,596 primates available for research in the state and Davis housed 2,530 of them. Most of the primates at Davis are rhesus macaques, although the university is also home to about 1oo titi monkeys. Neuralink inked the deal with UC Davis in September 2017, roughly three months after it told city officials in San Francisco that it had abandoned plans to build out an animal testing lab at its headquarters there. An architect working with Neuralink told San Francisco officials that the company planned to eventually build its facility outside the city. It’s not clear how long the contract lasts—the end date of the research is redacted. However, UC Davis generally reports its research grants in fiscal year cycles, and since Neuralink started funding research in the fall semester, the contract will likely need to be renewed after the spring semester. UC Davis heavily redacted its agreement with Neuralink before releasing the document to Gizmodo, citing exemptions to the California Public Records Act designed to protect unpublished academic research. “The courts have recognized that premature disclosure of proposed or on-going research may result in a chilling effect on academic research, noting the possibility for misappropriation of research results, the fear of additional disclosure in the future, and of potentially severe harm to the integrity of the research and to the investigator’s careers,” a spokesperson for the university wrote. The spokesperson also argued that the redactions would help preserve Neuralink’s trade secrets. Under the agreement, Neuralink employees can work side-by-side with academic researchers at the Davis facility. Davis researchers are allowed to publish their findings based on Neuralink-funded research, provided that they allow Neuralink to review the work prior to publication for confidential information. A Neuralink spokesperson declined to comment on the contract. Do you have a tip about Neuralink? Email us or contact us anonymously via SecureDrop.